Right when you thought Bryce Harper and Manny Machado made American sports history signing two of the biggest free-agent contracts in back-to-back weeks, Angels outfielder Mike Trout topped it. Days after Harper signed with the Phillies, he was already plotting to get Trout to return home to Philadelphia when his contract was set to expire in 2020. 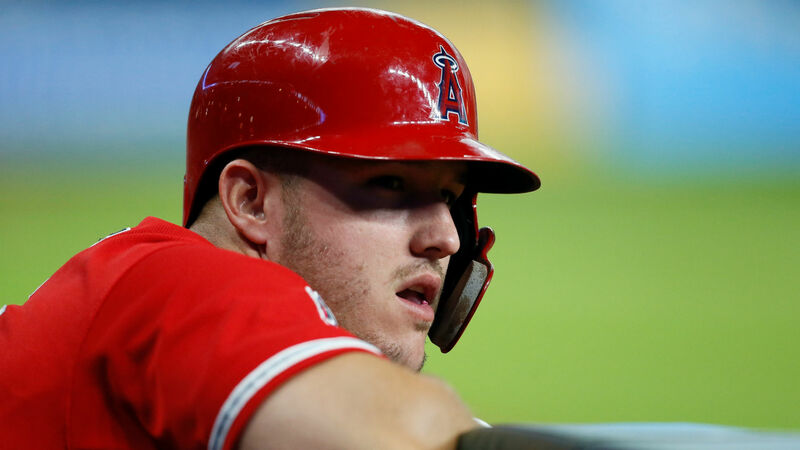 Not three weeks later, Mike Trout agreed to a reported $430 million contract extension with the Angles, making it the largest contract in professional sports history. Trout not only surpasses the highest paid player in MLB history, he also surpasses highest annual value. Before his contract, Arizona pitcher Zack Greinke was making the most at $34.4 million, but now Trout will be making an annual average of $36 million. First, Machado signed for $300 million over 10 years with the Padres on Feb. 20. At the time, it was the second largest total value contract in MLB history, behind only the $325 million extension Giancarlo Stanton signed with the Marlins in the 2014-15 offseason. That lasted all of eight days. Harper and the Phillies raised the stakes on Machado and Stanton’s deals with their 13-year, $330 million pact, setting the record for the richest contract in MLB history and the second-most lucrative for a North American athlete. Machado now ranks fifth in that department, while Harper is third. The list of richest contracts in American sports history includes mostly baseball stars. Here’s where Harper and Machado slot in. In 2016, ace David Price signed a seven-year, $217 million free-agent contract with the Red Sox. The 33-year-old is earning a base salary of $31 million in 2019 with four seasons remaining on his deal. Joey Votto signed a contract extension with the Reds in 2014 worth $225 million over 10 years. The six-time All-Star is earning $25 million in 2019. The Rockets guard is the only NBA player on the list. He signed a contract extension in 2016 worth $228 million over six years. The contract came during a time when the NBA’s salary cap went up from $94.1 million to $99.093 million. In 2012, Albert Pujols signed a $240 million contract for 10 years with the Los Angeles Angels. He was 32 at the time of the deal, which some consider among the worst in MLB history. Los Angeles will pay Pujols $28 million in 2019, $29 million in 2020 and $30 million in 2021 before it expires. In 2014, Robinson Cano signed the same contract as Pujols with the Mariners, choosing to leave the Yankees in a surprising free-agent move. Seattle traded Cano to the Mets in 2018, passing off the remaining five years and $120 million on the contract to New York. Miguel Cabrera signed a contract extension with the Tigers in 2016 worth $247 million for eight years. The slugger, now 35, will make at least $30 million each of the next seven seasons. In 2001, A-Rod left the Mariners to sign a contract with the Rangers, earning $252 million over the course of 10 years. At the time, it doubled the previous richest contract ever given in American sports history. He would go on to top that deal a few years later. In 2007, the two-time AL MVP signed an even bigger contract with the Yankees — $275 million over 10 years. A-Rod retired in 2016, but the Yankees still had to pay him through the remainder of his contract. The remaining balance, estimated around $27 million, was paid off in 2018. In 2019, Machado agreed to a 10-year, $300 million deal with the San Diego Padres — the biggest contract ever signed by a free agent in any U.S. sport. Machado was with the Orioles and Dodgers during the 2017-18 season. The four-time All-Star made $16 million between the two teams last season. In 2014, Stanton signed a contract extension with the Marlins for 13 years and $325 million. The Yankees traded for Stanton in 2018, assuming the remaining 10 years on the deal. The 2017 NL MVP can opt out of the contract in 2020. Less than two weeks after Machado signed his free-agent deal, Harper’s 13-year, $330 million contract with the Phillies blew past it and surpassed Stanton’s record as the richest in MLB history. That’s an annual salary of $25.38 million — smaller than Machado’s AAV but more lucrative overall. In 2018, the professional boxer agreed to an 11-fight, $365 million contract with DAZN, a global sports streaming service. Alvarez is earning an average of $73 million annually, making him one of the highest paid athletes in sports internationally. Less than three weeks after Bryce Harper’s free-agent deal, Trout agreed to a $430 million contract extension with the the Los Angeles Angels for 12 years. The deal came after Harper was already lobbying to get Trout to the Phillies once Trout’s contact was up in 2020. The 27-year-old surpasses boxer Canelo Alvarez by more than $65 million.